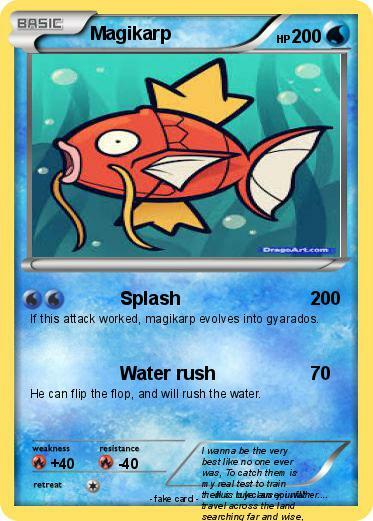 If this attack worked, magikarp evolves into gyarados. He can flip the flop, and will rush the water. Comments : I wanna be the very best like no one ever was, To catch them is my real test to train them is my cause, i will travel across the land searching far and wise, its pokemon to understand the power thats inside, poekmon gotta catch em all, its you and me, i know its me destiny, pokemon, ohh your my best freind with a world we must defend, pokemon, ill teach you and youll teach me pokemon, gotta chatch them all, gotta catch them all, poekmon.